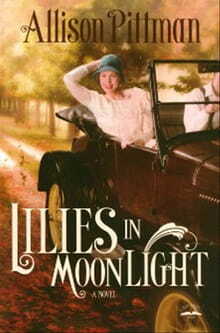 EDITOR’S NOTE: The following is an excerpt from Lillies in Moonlight by Allison K. Pittman (WaterBrook Multnomah). Just ten o’clock in the morning, and already Lilly Margolis could feel the trickle of sweat sliding between her shoulder blades. Head up. Big smile, chin out, she silently rehearsed. Good morning, madam. Are you the lady of the house? Cosmetics. Lilies in Moonlight. I use it myself. She held out her arm, focusing on the creamy silk of her skin against the dark wood of the door. Makes my skin smooth as silk and irresistible to the touch. At least that’s what my boyfriend says. Wink, wink. She didn’t really have a boyfriend, but every man who’d ever touched her said she felt like satin. Or cold milk. White and soft and pure. She, of course, didn’t use Lilies in Moonlight body crème. She couldn’t afford it. Nothing but Ivory soap from the five-and-dime and maybe a dab of Jergens lotion. May I introduce you to the other irresistible offerings from Dalliance Cosmetics? This little case right here is a regular treasure trove of beauty. This is where she’d hold up the case. She wore three bright red bangles on her left wrist, including one that held the case, and they’d clank together as she lifted it. Right arm? Pure, soft, white, unadorned. Left arm? Fashion and beauty in one grip. Lilly Margolis was everything—blond, bobbed hair, perfectly plucked eyebrows, bright red lips—all wrapped up in the perfect porch-sized package. What would Mama say if she could be on the other side of that door? No great mystery there. She’d say Lilly looked like a tramp, that God would condemn her for cutting her hair. To her, Lilly’s smooth skin meant that she was lazy, pampered, indulged. Lilly banished such ugliness behind what she knew to be a dazzling face. Her mother might not approve, but the rest of the world sure did. Men most of all. And if she got lucky, the woman behind this door would too. Resolved, she touched her painted fingertips to her hair, doubled her smile, and rang the bell. “What do you want?” The woman on the other side of the door wore a faded housedress. Her hair was mostly piled on top of her head, though tendrils floated around her face. And Lilly faced the door again. She relaxed her posture, letting her shoulder stoop with the weight of the tan leather case, getting no satisfaction from even the clank of her bangles. She turned and walked down the front steps. Those potted flowers looked a little less lovely than they did when she first walked past them just a minute ago. “Should’ve opened with the flowers.” Next door, she’d know. Back on the sidewalk, she assessed the next house. Trim lawn, roses in bloom at the corner. Chin up, big smile, shoulders squared, she strode up the walkway, looking confident lest the lady be looking out the front window at that moment. At the door, she shifted the leather case from one hand to the other, bangles rattling as she raised her fist to knock. The door opened and this woman looked much like the previous one, but her hair was a little neater, her dress less faded. “Why yes, I am.” The woman touched her fingers to her throat, as if shocked to be greeted with such a compliment. A softer closing of the door this time, but a closing nonetheless. Back the sidewalk, Lilly looked up the street. One house after another, all of them small and square. In some ways, no different from the row of clapboard shacks she left behind in Miresburgh. But here there seemed to be a sweetness to the smallness. Maybe it was the trim green lawns, the varied gardens, the short white fences. Who knows? Maybe her own street would take on life and beauty if it were bathed in this relentless Florida sun. Still, small houses meant small lives; small lives meant small dreams. Green grass or not, when she looked down the street all she saw was one closed door after another. “Never gonna sell nothin’ in this lousy neighborhood,” she muttered under her breath. Still, she wasn’t about to cry over it. After all, it could be worse. She could be one of those women all wrapped up in a housedress nowhere to go. Why, they might be looking out of their windows right now thinking, What is that stunning vision of beauty doing on our humble little street? Lilly herself had been inspired by the beauties she’d seen in the movies and magazines. Mindful of her purpose, she smiled sweetly at the young woman pushing a pram, followed by two sticky children. Half a block behind Lilly was a park. She’d planned to stop there and sit on one of its bright red benches to eat the cheese sandwich that was wrapped in wax paper and nestled among the bottles and jars of Dalliance Cosmetics in the tan leather case. She turned around and followed the woman and the pram and the sticky children, who took turns looking back at her. Lilly stuck out her tongue and they did too. The mother never glanced over her shoulder even once. Once in the park, the sticky children ran to the swing set; the mother settled on a bench and pulled the baby out of the pram to settle it on her lap for a gentle bouncing. “Cute baby.” Lilly chose the bench on the opposite side of the little walking path that stretched around the park. “His name’s John.” The recollection of the name seemed an exhausting endeavor. The mother smiled weakly, then hollered at the sticky children— June and Teddy—telling them to play nice and take turns. Baby John began to fuss, bucking straight back in his mother’s lap. “So you never have time to bathe?” Lilly widened her eyes, creating an image of innocent incredulity. Lilly pouted. “Poor dear.” She lifted the tan leather case and set it beside her. The mother closed her eyes, revealing thin lids with tiny blue branching veins. Perhaps it was the shiny silver lid that caught the attention of the now sticky and sweaty children, because they abandoned their swings and ran pell-mell toward their mother. The mother opened her eyes again, transformed. Soft and content. Perhaps some innate protective sense had taken over the children, because once again they abandoned their swinging and were running— more cautiously this time—toward the benches. Now the mother, with her arms crossed, looked at them with narrowed eyes. Teddy and June obeyed, taking sulky backward steps so their selfish mother could gaze upon their sweaty, sticky, grubby faces for as long as possible. “I don’t have friends who visit my powder room.” The mother lifted baby John out of the pram again and held him close, resting her chin on top of his bald little head. Teddy and June would not be denied a third time. They scrambled onto the bench, wedging their way between the two women. Lilly leaped to her feet, barely snatching the pretty pink jar from the grimy clutches of June. Once again the mother’s manner softened. What sternness she had dissolved like so many bath salts as her children peppered her with silly questions. Who was this lady? What was in the jar? Could they have a Coca-Cola with their lunch when they got home? And could the lady come have lunch with them? And wasn’t she pretty? With gentleness Lilly couldn’t have imagined, the mother answered each child. Yes, the lady was pretty, but no, she was far too busy to come home for lunch. This response was given with a wary eye across the top of Teddy’s grubby face, but Lilly just smiled and winked. It was enough that they thought she was pretty. Lilly checked to be sure the silver lid was screwed on tight. Then, as the little family debated whether they should play on the swings or the slide, she reached inside baby John’s pram and nestled the lavender bath salts within his blankets. She quickly closed the latches on her leather case and lifted it off the bench. Three blocks later Lilly sat down again—this time at a drugstore counter—and filled out a sales slip. She thought back to the nearly empty powder box on the washstand in her room at Mrs. Myrtle’s Hotel for Women. She had a little more than three dollars in there—two of which were meant for next week’s rent. A couple of big sales would make up the difference, but she’d need to find better hunting ground. “Hey, lady.” The man behind the counter wore a blue-and-whitestriped shirt and blue suspenders. His gray hair was thick and curly; the glasses on the bottom of his nose gave a kindly effect absent from his voice. Lilly dug into her little beaded purse and pulled out a dime. “Two Coca-Colas.” One for later tonight with the supper included in her two-dollar-a-week rent. The man behind the counter popped the top off one of the bottles before swiping the dime across the polished wood. Lilly quietly unwrapped her sandwich, keeping it hidden on her lap as she tore off one bite at a time, chewing slowly and washing it down with sips of the cold, dark, fizzing soda. Behind her the bell rang, and though she didn’t know another soul in this part of town, Lilly spun on her stool to see who walked in. Two women, probably in their fifties, wearing identical gray dresses, white aprons, and ugly brown shoes. “Afternoon, ladies.” Now the man behind the counter lived up to his friendly visage. “You read my mind,” Annie said, and the two of them giggled as if it were truly funny. “Sounds good,” Lilly said. She imagined herself part of their conversation, but they responded with a dismissive glare. The few bites of sandwich sat heavy in her stomach, and she wished for just a minute she were sharing a sticky table with little June and Teddy. Deciding these women weren’t worthy of her smile, she drooped her face into an exaggerated pout and twirled back to her sandwich, giving the women a view of the back of her neck, imitating the pose she’d seen on the cover of the Vogue magazine on the newsstand in the corner. She continued with her sandwich and soda and sales-ticket book, all the while listening to Annie and her friend. Apparently their mistresses were at a weekly country club luncheon, meaning somewhere within walking distance there was a neighborhood with money. Lilly tore her sandwich into smaller and smaller pieces, making it last long enough for Annie and her friend to finish their egg salads and chocolate sodas. Ed was not fooled for a moment; he’d come close to catching her midbite several times, but every time he asked if she wanted to order something, Lilly smiled her brightest and said no, thank you, she was watching her figure. At ten minutes to one, the maids slurped the last of their sodas and Bid Ed good-bye. Lilly swigged the last of her Coca-Cola—warm and flat by now—and carefully folded the square of wax paper to put back in her leather case. It would wrap tomorrow’s sandwich. “See ya, Ed.” She gave a little salute, bangles clanking, and set the door’s bell ringing. With the women in gray about twenty paces ahead, Lilly straightened her shoulders, refreshed her grip on the case’s handle, and took a determined step. Fortune could not be far away. Excerpted from Lilies in Moonlight by Allison Pittman. Copyright 2011 by Allison Pittman. Excerpted by permission of multnomah Books, a division of Random House, Inc. All rights reserved. No part of this excerpt may be reproduced or reprinted without permission in writing from the publisher.